No cake has haunted me as much as this one. Also no post has disappeared 3 times after being written and saved! 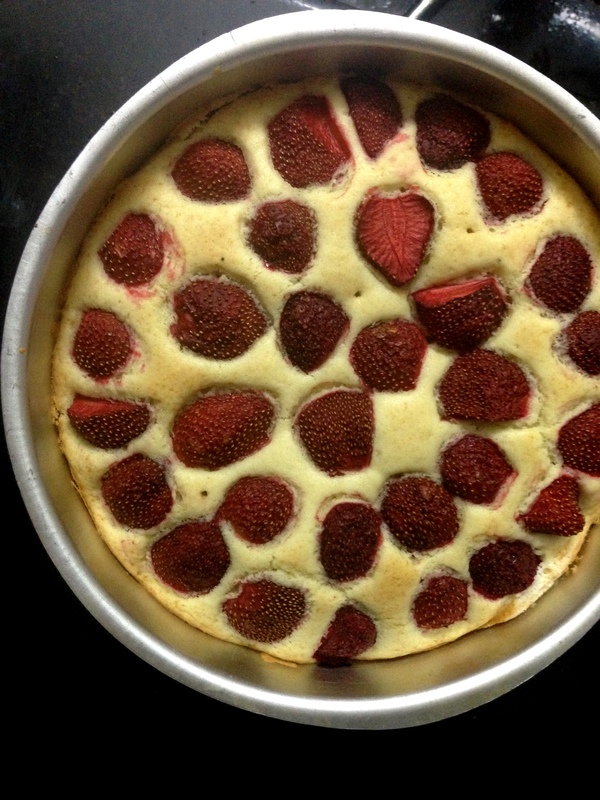 Four weeks ago, the interwebs starting popping pictures of a beautiful strawberry cake. First one avid baker/blogger posted it and an avalanche was set off. Since we are a small incestuous group of bloggers who are connected on multiple social media platforms, I began seeing versions of cake all through the week and with each cake my anxiousness to make it increased. Sunken berries, wheat and other flours, egg-less and versions with egg, round, rectangular and square. There is a whole album dedicated to this cake if you want to check out the other versions. I stockpiled strawberries because I feared they would not be available as the season here is just a few weeks. And oh! I commented on how much I wanted to make this cake on every single picture that I saw. I think everyone who saw my “OMG I need to make this cake” comment gave me the eyeroll. The original recipe is from the famed blog Smitten Kitchen. I used home made white butter and the flavour was so deep that I saved the rest of the home made butter to make this cake again a few days later. I reduced the quantity of sugar and surprisingly, my cake took only 35 minutes to bake as against 50 mentioned in the original recipe. 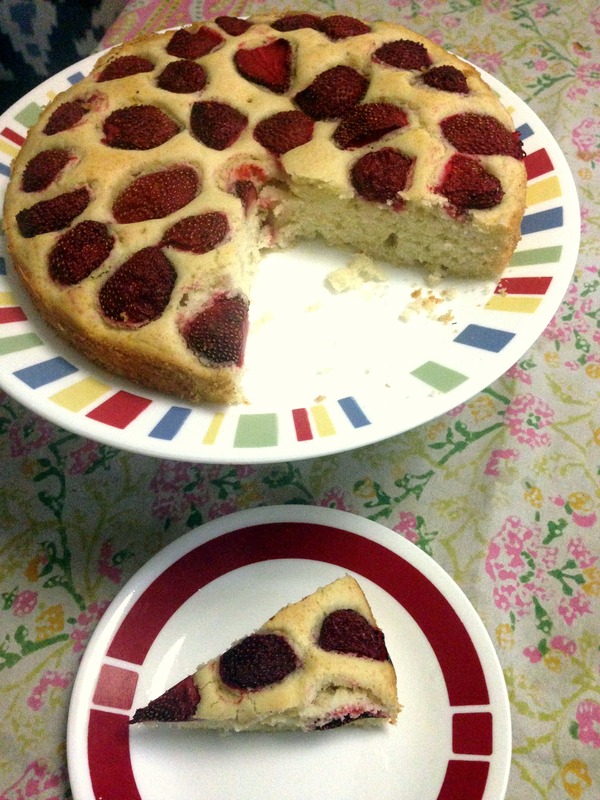 To stop the strawberries from sinking into the batter, I baked the cake at 200 degrees C for the first 10 minutes on Anand’s recommendation. This also gave me a beautiful golden crust on top and the sides. Note: The batter rises quite a bit while baking and using a smaller tin will cause the fruit to be buried under the batter. So please use a 9 inch tin. Preheat the oven to 200 Degrees. Butter a 9 inch baking pan and line the bottom with parchment paper. Beat the butter and the sugar till pale and fluffy, takes about 2 minutes. Add egg, vanilla & milk and beat till combined. Add the flour mixture in 2-3 batches, mixing gently with a spatula. Do not overmix the batter. Pour this batter into the buttered and lined cake pan, smoothen the top with the spatula. 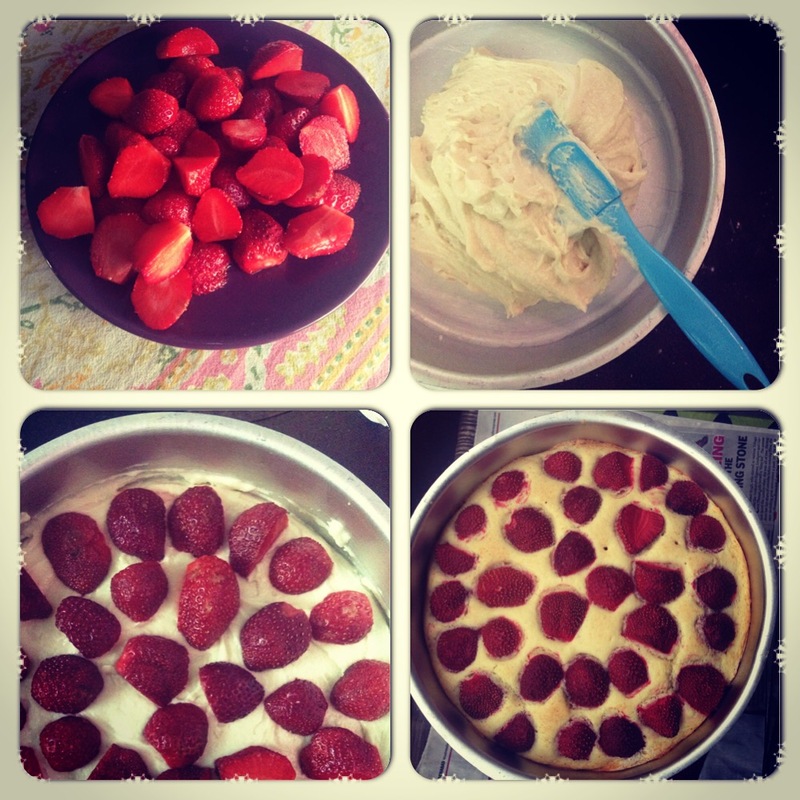 Arrange the halved strawberries, cut side down close together till most of the batter is covered. Sprinkle the cake with the granulated sugar. Bake in a preheated oven at 200 Degrees Celsius for 10 minutes. Reduce the oven temperature to 175 degrees and bake for 20-25 minutes or till a cake tester comes out clean. The original recipe calls for 50 minutes. Remove the cake from the oven and cool on a wire rack. Unmould and slice. This cake is best eaten fresh and still warm from the oven. If you have any leftovers, refrigerate it in a covered box. Wow this looks yummy..surely going to try this out.. But can it be made with whole wheat flour instead of maida?